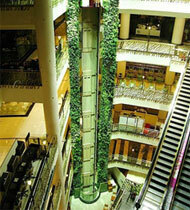 To create a vertical flower/colored walls, or “vertical gardens” the process requires a prior establishment of a special structure in which the vegetation shall be planted. Layering geotextile fabric, the surface of the structure shall be covered by planted ornamental and flowering plants. Positioning of such walls is possible in both interior and exterior designs. The purpose of vertical gardens is to compensate in a short amount of time for a shortage of large green areas, and additional decoration of facades and walls, preventing noise, dust and insolation of individual elements. The vertical gardening solutions can hide unsightly walls or create picturesque fences. If the implemented solutions are maintained properly, and the vegetation grows and develops the right way, these plants protect the walls of the buildings. When a selection of plants for landscaping walls and fences should be done, the direction of the light and the positioning of the object largely determine the plant species. Plants for vertical gardening are likely to grow quickly, but require fertile soil with almost 40-50cm depths. It is recommended when planting vegetation, to nourish with humus and organic manure ( a mixture of nitrogen, potassium phosphorus). Suitable plants are Actinidia, Hedera, Parthenocissus, Tecoma, Campsis, Pyrostegia, Solanum, Clematis, some species of Lonicera, Rosa, Hydrangea, as well as Bougainvillea, Wisteria and Jasminum if horizontal elements or pergolas are present.